When the cornea is misshapen, light bends (refracts) incorrectly, leading to vision problems. Refractive surgeries aim to reshape the cornea, thereby improving vision. LASIK is one of the most popular types of refractive surgeries. However, not everyone is an appropriate candidate for LASIK. Fortunately, photorefractive keratectomy (PRK) is often a suitable treatment option for patients who are not good candidates for LASIK. 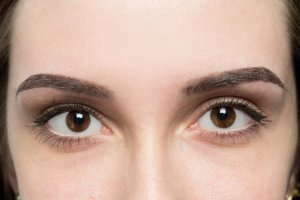 Although PRK, also known as advanced surface ablation (ASA), predates LASIK, it yields the same visual results as LASIK. During LASIK, the eye doctor creates a small flap in the cornea that allows him or her to access and reshape the underlying corneal tissue. During PRK, the doctor removes the whole epithelium, the cornea’s outer layer. The ophthalmologist then proceeds in the same way as he or she would with LASIK, using a tiny laser to reshape the curvature of the cornea. Because the body must regenerate the entire corneal epithelium after PRK, recovery time is longer with PRK than it is with LASIK. Initial healing can take a week, plus a few more weeks before visual acuity stabilizes. Again, however, the visual results are ultimately the same as with LASIK. Following PRK, most patients wear a contact lens for five to eight days, to help protect the eye. Your doctor will put the contact in and take it out for you. You may also take prescription or over-the-counter pain pills and use anti-inflammatory eye drops. Protect your eyes with good sunglasses during healing. Unlike with LASIK, PRK patients usually have one eye treated at a time. Your ophthalmologist may recommend a healing period of between one week and one month before operating on the second eye. This helps you stay functional while you heal. Your eye doctor will adjust your glasses or contact lenses accordingly. 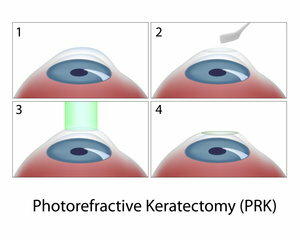 Despite the longer recovery time, PRK has some advantages over LASIK. A small percentage of LASIK patients experience complications associated with corneal flap creation. PRK patients do not have to worry about this. PRK and LASIK both typically cause dry eyes for three to six months. However, this problem is often less pronounced in patients who undergo PRK. People who opt for PRK might also end up with better night vision than those who opt for LASIK. Success rates vary, and eye surgery always bears risks of under-correction, loss of vision, infection and inflammation. However, about 70 percent of patients achieve 20/20 vision after PRK, and 92 percent end up with 20/40 vision or better. If you are considering your refractive surgery options, call us today so we can help you decide which type of vision correction surgery will work best for your eyes.